In addition to our expert Fundholder Engagement team, there are a number of resources at your disposal to help you create a robust and efficient philanthropic plan. We are committed to sharing our community and philanthropic knowledge and have put together reading lists, issue briefs, and quick links to other resources to empower you to make impactful giving decisions. If you need help choosing the right Fund for you, please contact Aneil Gokhale or Nicole Lilauwala. Find out about some of the best organizations in the city in our Good to Give Guide (June 2017). Check out our Family Philanthropy booklist, to find out our top picks from philanthropic leaders. Check out our Canada 150+ booklist to be inspired by the diversity of Canadian identity throughout our sesquicentennial year. Toronto Foundation has made a commitment to work towards reconciliation in relationship with the Indigenous community. To learn more about what reconciliation means, check out our Reconciliation Issue Brief. We created a primer on addressing some of the main misconceptions philanthropists have about giving. Read our Grantmaking Primer here. "I established my own Fund because I wanted to start my own legacy for giving back to the community. 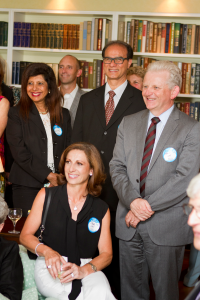 I greatly value all of the support provided by the Toronto Foundation for me as a Fundholder."